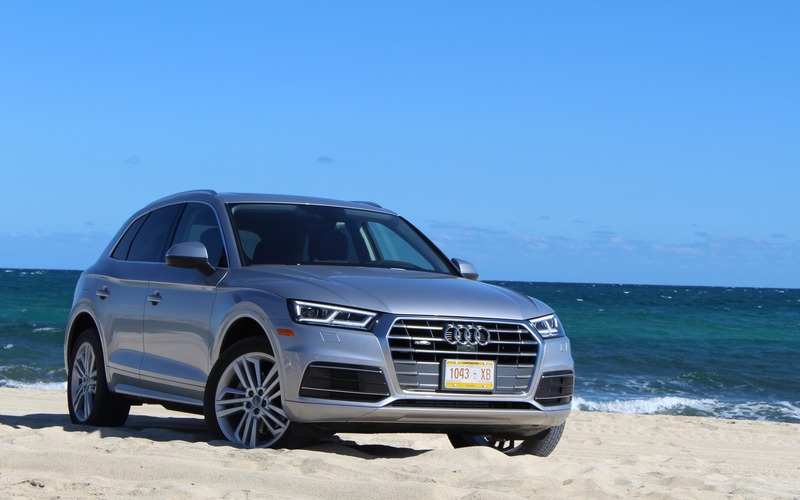 LOS CABOS, Mexico – Audi’s Q5 compact SUV is ripe for a redesign, as it’s been on the Canadian market largely unchanged since 2009. Eight years is a long time in the automotive industry, where rivals often introduce new or significantly redesigned models such as the BMW X3, the Cadillac XT5, the Lexus RX and the Mercedes-Benz GLC. And yet, the Q5 remains Audi’s best-selling vehicle in Canada and in the United States, proof that its qualities haven’t faded away with age. Its popularity probably explains in part why the automaker took so long to develop a new generation of the Q5, which will hit the Canadian market in the spring of 2017 as a 2018 model. Audi also built a brand-new assembly plant in Mexico, which will be the birthplace of all Q5s earmarked for the Americas and even Europe. Judging by its new exterior design, the manufacturer didn’t want to take any styling risks. Its front end is more refined, thanks to its silver hexagonal grille, inspired by those of the brand’s other recent products, including the Q7. Aside from some minor curves added to the sheetmetal, the SUV’s look has evolved very little. We look at the 2018 Audi Q5’s rear end and profile, and it’s difficult to tell it apart from the current generation. The Q5 is as always an attractive vehicle, but we can criticise the lack of boldness in its new styling. On the other hand, the cockpit’s design is more modern. The overall appearance is more sophisticated and elegant, with a sportier-looking steering wheel and an improved finish. The infotainment screen is now perched on top of the centre stack instead of recessed in it, the switchgear has a richer feel to it and the available trimmings, such as the open-pore wood, look pretty good. 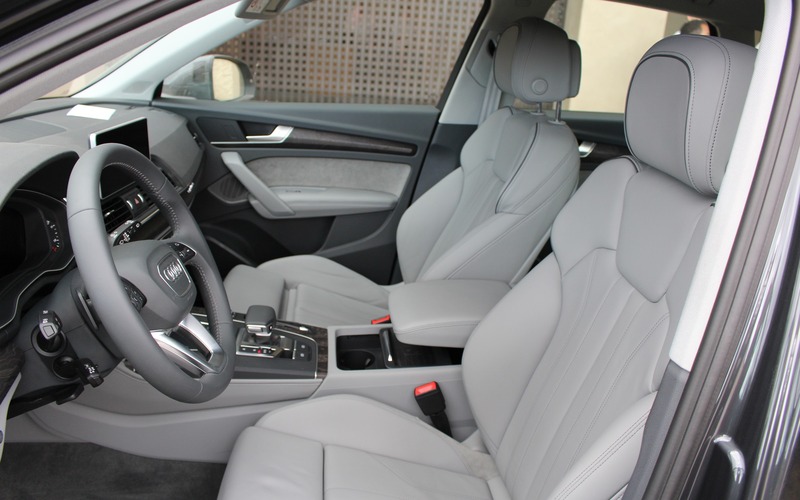 In addition, we can optionally equip the 2018 Q5 with the Audi virtual cockpit. This driver-focused instrumentation swaps analog gauges for a 12.3-inch fully digital display, configurable to show the trip computer’s information on the forefront or a full-width navigation system map. It’s very modern, and very handy, too. However, the infotainment system’s input controls are located in front of the shift lever, a little out of reach; the other way around would’ve been better. The Q5’s wheelbase has been stretched by a scant 12 millimetres and its overall length has grown by 24 mm, while width and height remain practically unchanged. So, no significant gains in interior space, which is still interesting for four passengers, a little tight for five. As for the cargo area, its volume rises from 540 to 550 litres with the rear seatbacks in place; this doesn’t sound like much for a compact SUV, but these are the European numbers that don’t count the space above the vehicle’s beltline. Inversely, cargo volume with the seatbacks folded down shrinks from 1560 to 1550 litres. As for powertrains, the 2018 Audi Q5 relies once again on a turbocharged, 2.0-litre four. However, this new generation boasts 252 horsepower—up by 32 compared to the current Q5 2.0 TFSI—and 273 pound-feet of torque. And what’s connected to this engine is also all new. First, the eight-speed Tiptronic transmission makes way for a seven-speed, dual-clutch gearbox that works very well. In addition, the Q5 is equipped with a new all-wheel drivetrain called quattro ultra. Unlike Audi’s conventional quattro setup, which offered a 40/60 front/rear torque split in normal driving conditions, the quattro ultra system sends 100% of engine torque to the front wheels and disconnects the rear axle in order to reduce friction and improve fuel economy by 0.3 L/100 km. As needed, the system can reassign up to 50 percent of available power to the rear wheels in 220 milliseconds, triggered by either wheel slip or spirited driving. Will the quattro ultra drivetrain be as capable in winter conditions as the conventional quattro setup? We’ll have to perform a more substantial evaluation of it during the cold season. However, we can say that it handled itself nicely in the sandy trails of the Mexican desert. And do we really need a full-time AWD system when we’re driving at 100 km/h on the highway, or stuck in gridlock traffic? Not really. The quattro ultra system equips the totally redesigned 2017 Audi A4 allroad as well as the new Q5. For now, it will only be matched to four-cylinder powertrains. Which means the next-generation Audi SQ5, which should still get a 354-hp, turbocharged V6, will adopt the conventional quattro hardware and an eight-speed automatic. Let’s get back to the 2.0 TFSI engine, because it’s the only one we’ll be getting in Canada when the 2018 Audi Q5 will hit dealerships. It does the job, especially as the SUV’s weight dropped by some 200 pounds, but its performance isn’t breathtaking. The gasoline V6 engine currently available will be retired, and the Volkswagen-Audi group has likely pulled the plug on diesel engines in Canada and the United States. That’s too bad, because the 190-hp, 2.0 TDI and 286-hp, 3.0 TDI engines we sampled in Mexico were pretty enjoyable with plenty of low-end torque while consuming well under the 10 L/100 km mark. On the other hand, a hybrid version of the Q5 with a 245-hp powertrain is in the cards. 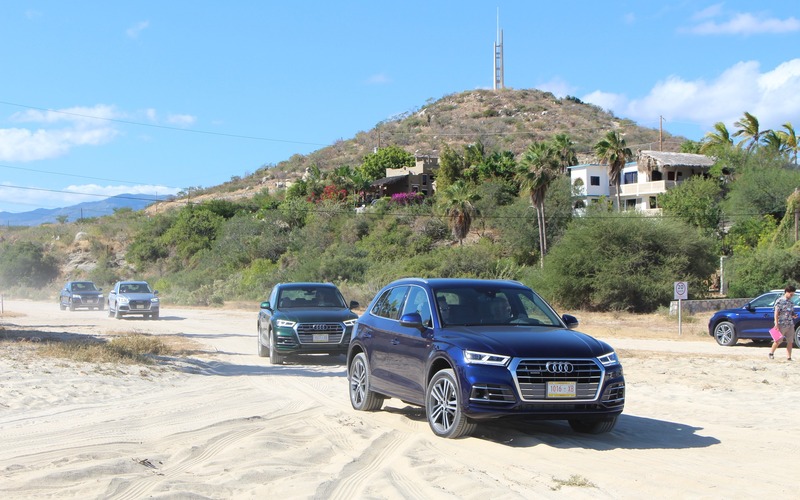 The Q5s we drove in the Mexican desert offered excellent road manners, thanks in part to the optional air suspension. Whether we chose the Dynamic or the Comfort mode, the small SUV adapted to all driving conditions and impressed with its poised ride. Unfortunately for now, the air suspension won’t be available in Canada, so we’ll have to wait before pronouncing ourselves on the Canadian-spec Q5’s road manners. On the other hand, aside from the base suspension setup, we will be getting an optional variable damping system. Trim and feature levels haven’t been established yet for the Canadian market, but Audi will likely offer Komfort, Progressiv and Technik variants. Among the available features will be a panoramic sunroof, a power tailgate as well as a battalion of advanced safety driving aids, including adaptive cruise control with autonomous stop-and-go driving. The 2018 Audi Q5 won’t revolutionise the luxury compact SUV market, but shines in all the important aspects of this segment, whether it’s technology, fit and finish or driving characteristics. It’s in the little details that the automaker succeeded in improving its utility vehicle, which should be as popular—if not more—than the outgoing Q5. Its base price hasn’t been announced yet, but we estimate it at about $45,000. Audi is starting 2017 in a big way by unveiling an all-new SUV at the Detroit Auto Show, the Audi Q8 concept, which will be the inspiration for a production Q8 in 2018. The Audi Q8 will blend the dynamic styling of a coupe with the versatility of an SUV.